Cell adhesion is a complex mechanism involved in a variety of processes including cell migration and invasion, wound healing, tissue remodeling, and micro-vascular occlusion. Functional Fluidics has experience in the development of functional cell-based assays performed during simulated blood flow thus enabling the collection of physiologically relevant data. Microfluidic channels are coated with one or more ligands (i.e. VCAM-1, collagen, P-selectin) or seeded with endothelial cells such as HUVECs or similar adherent cell lines. User-defined flow conditions, including pulse frequency (0-2 Hz), shear stress (1-200 dynes/cm2), and temperature (37oC), are regulated by an external control unit consisting of an air compressor and electro-pneumatic regulator. Compressed air forces blood samples through micro-fluidic channels across a common viewing window (350 um width x 75 um height). Cell adhesion is visualized, in real time, through bright-field or fluorescent microscopy. Digital images are acquired with a high resolution CCD camera. Cellular imaging and analysis software provides coherent image review, analysis, and data management. Blood samples (whole or isolated cellular components) at baseline or following drug treatment (single dose or dose response) are subjected to physiologic flow across an adhesive substrate of interest. 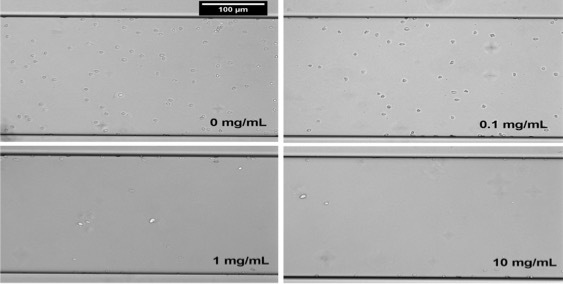 The test compound inhibits whole blood adhesion to immobilized VCAM-1 during physiologic flow. A) Baseline adhesion varied from patient to patient. Individual patient response demonstrated a dose-dependent decrease in whole blood adhesion to VCAM-1. Each data point represents the average number of adherent cells acquired from three independent positions within micro-channels. B) The test compound reduced whole blood adhesion to VCAM-1 at 0.1 mg/mL by 18% (p = 0.0015), at 1.0 mg/mL by 69% and at 10.0 mg/mL by 79% (in both cases, p < 0.001). VLA-4 blockade by natalizumab inhibits sickle reticulocyte and leukocyte adhesion during simulated blood flow. TR2/TR4 overexpression in a humanized sickle cell disease mouse model decreases RBC adhesion to VCAM-1. Increased erythrocyte adhesion to VCAM-1 during pulsatile flow: Application of a microfluidic flow adhesion bioassay. Pulsatile Flow Promotes Adhesion in Sickle Cell Disease: Clinical Application of a Microfluidic Bioassay.